I don’t usually get emotional about voting. In fact, up until 5 years ago, I was one of the apathetic many who didn’t believe that my vote counted for anything, so I didn’t vote at all. Four years ago, I knew that I had to vote. Even if my state wasn’t going to go the way I wanted, I had to vote so feel some power over the situation. I voted not so much for Kerry, but against Bush and his policies. This year was so different for me. Sure, I was voting against Bush and his polices, which I really believe McCain would have brought to the presidency. But more than that, I was voting for Obama. I believe in Obama. When I listen to Obama talk, I feel inspired. I get that knot in my throat, butterflies in my stomach. Prior to this, I had NEVER felt inspired by a politician. NEVER. Ever. I’m going to honest. Race never entered the picture in my decision. I honestly think that Obama is the best person for the job at hand, and he could have been purple, for all I cared. But after I cast my ballot yesterday, I found myself getting teary-eyed leaving the polling place. For the first time in this long, drawn-out process, I finally realized how historic it was that I got to vote for an African American for president. For the first time in a very long time, I was proud of my country. And I get to say that I was there. I was there when the United States elected its first African American president. I was there for a truly historic event. I was there. Huh. I dreamed that I met Barack Obama last night. I was riding the bus through Vienna (VA, not Austria), and noticed him in the back of the bus, working on something. For a while I did the “looking but not looking” trick to see if it was really him. Once I confirmed that it was, indeed, him, I debated about heading back and introducing myself. At first I thought that, no, I didn’t want to interrupt him, but then realized that if he really wanted to get some work done, he probably wouldn’t have been taking the bus in the first place. So, I headed back and introduced myself. I sat in a seat near him, and we chatted as the bus toured Vienna. Shortly after that I woke up, so I don’t know if there was a rally in Vienna or what. Very weird, though…maybe I’m channeling Kirsten. Our group met in the cafeteria of the Rayburn representative office building. Let’s just say it’s a far cry from the Goddard cafeteria. We went over our strategy again before our first visit, and worried about the couple of people who did show up (one turned up in front of the office of our first visit, the other turned up later in the day). The day was mostly low-key with mere moments of action puctuated with hours of waiting. 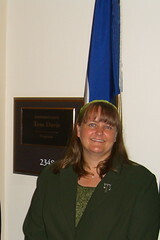 I made 5 visits &#150 4 representative’s offices and 1 senator. Members of our group make a total of 8 visits, but when the schedule between visits was tight (30 minutes), we split the group to make both. Each meeting went very well. The basic structure of each meeting was: introductions, a few talking points, a few anecdotes relating the NSF to our home institutions or institutions in the congress-person’s district, thank yous and a quick exit. Since the National Science Foundation (NSF) budget has already been through the full House and the Senate appropriations committee, we were basically sending a message of thanks to the congressional offices we visited. In fact, the NSF budget has seen a 7.5% increase in the House, and nearly that in the Senate. The one thing we were requesting was that congress keep the increase through the conference or omnibus bill. Each meeting went very well. Since most of the VA legislators were in favor of increasing the NSF funding, we were mostly preaching to the choir. In fact, one of our visits was to the chair of the House’s science appropriations committe, in which case we were preaching to the preacher. I ended up leading our first meeting of the day. It went very well, though I didn’t bring up a few of the points I would have liked to  so much for 20/20 hindsight. As the day wore on, though, our group started to get a good rhythm going, and were able to pick up slack in the conversation when things lagged. Having said that, there was one member of our group who really brought things down. He was from my district, and was originally supposed to lead the meeting for my representative. Thank FSM he got caught in traffic. He didn’t show up to the orientation last night, so he didn’t know how these meetings were supposed to go. One thing about the meetings is to make a quick exit. So, when things were winding down and we had the staffer on our side, someone would ask what we as scientists could do to help in the future  this was our cue that we were going to cut and run after the answer. This guy, though, just didn’t get that. In at least two meetings that I was in with him, after we had asked the “what can we do for you” question, he would bring up something completely unrelated to what we were talking about and certainly not in the spirit of getting out of there quickly. Ah well. We survived despite this guy. One thing several people have asked me is whether or not this sort of thing really helps. I have to say that I wondered the same thing going into this project. The answer came when we asked the staffers what we could do for them in the future. Every single one of them said to keep up what we’re doing  contact our congress people, visit our congress people, and have these kinds of lobby days. In fact, the staffer in the House science appropriations committee chair made the point that up until just a few years ago, the math and science lobby seemed to disappear. It took the US’s competitiveness crisis (i.e. that we are not turning out the numbers of scientists and technical graduates that we’re going to need to compete in the global market) for the math and science lobby to return. So, we really need to lobby through letters and visits and make ourselves available as experts on these topics, and we really need to look at this as a long-haul thing, not just something to do until the crisis has passed. And just one more note: I mentioned that much of the day was waiting. Well, while one of the team members and I were waiting for our final visit, getting a cup of coffee (him) and chai (me) in the Senate coffee shop we saw Jenna Elfman. Who’d ‘a’ thunk? This afternoon we had the orientation for the lobby day tomorrow. I was struck at how easy it was to get into the House office buildings. Somehow, with all that’s been going on in the world, I expected that there would be security up the gazoo with only people with an appointment allowed in. Nope. I just had to have my bags X-rayed and walk through a metal detector, and there I was. Our meeting was in the Science Committee’s main hearing room. The walls were adorned with portraits of all of the former committee chairs, and looked much as the hearing rooms do on TV. We spent about an hour and a half listening to people talk at us, going over our talking points and discussing how our congressional visits would go the next day. Then we broke up into our teams. My team had five members, plus our leader who was to shuffle us around the next day. We went over our schedule for the next day, talked a bit about our respective backgrounds, and went over the general outline of each meeting yet one more time. The other person from my district didn’t show, so suddenly I was assigned to be the lead for the first meeting tomorrow. Yikes! Afterward there was a reception for us with food and drinks. This one was held in another of the science committee’s hearing rooms &#150 this time the one where most of the NASA and space appropriations committee meetings are. The walls were covered with Hubble Telescope pictures. I didn’t end up staying too long, but did chat for a while with one of my team members and a neurologist from Arkansas. Oh, and to the three people who sat near me in the orientation meeting #150; if you don’t feel like you need to be in the meeting, then don’t show up. I don’t want to hear you clacking away on your blackberry the whole time or to listen to your under-your-breath comments (which, by the way, weren’t really under your breath).